Batter and Beat: Good morning sunshine! Ah, the traditional American breakfast - there's nothing like sitting down to a huge platter of eggs, pancakes and greasy, gristly meat at the crack of dawn. Blech. I've never been a breakfast person, and I'm even less of a morning person so on most days a jumbo latte gets me through until lunch time. However, a nice light combo of fruit and yogurt is very appealing to me...better still with a little granola. Breakfast parfaits have become so popular that even fast food chains are selling them, but you can easily make them at home. They look lovely, taste delish, and are perfect for those rushed mornings. 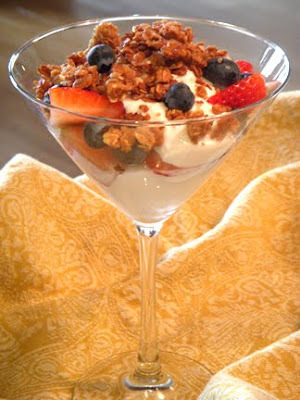 You can assemble the parfaits as you wish, I made a single layer of yogurt, fruit then topped it off with the granola. Makes 4 servings. *NOTE: I omitted the dried fruit in the granola since fresh fruit was used in the parfait. In a large bowl, toss the oats with the cinnamon and salt. In a medium bowl, stir together the oil, honey, brown sugar, and vanilla. Whisk until completely combined. Pour the honey mixture over the oats mixture and use your hands to combine them: Gather up some of the mixture in each hand and make a fist. Repeat until all of the oats are coated with the honey mixture. Bake for 10 minutes, then remove from the oven. Let cool completely. Sprinkle the raisins and cherries over the granola. The granola will keep for 1 week in an airtight container.